Have we gentrified our pubs so much that the life and soul of “the local” has all but disappeared? The thought came to mind recently as I sat in the bistro of our local, a typical suburban pub in Sydney within walking distance from home. Let’s face it, there is nothing better than the company of friends and good pub food washed down with a couple of schooners of Fourex. Not some beer brewed with water taken from a stream on the eastern side of a mountain in some place I couldn’t pronounce even if I wasn’t into my third schooner. Perhaps I’m showing my class here, (I did say class) but one of the things I truly look forward to is a trip into the bush, the outback, down a dusty track where you are likely to develop a thirst that can only be quenched with a schooner or two at day’s end in a pub that is most likely called “The Royal” or maybe “The Railway” or “Tattersall’s”. Crikey, even Janet (Mrs Landy) has been known to down a beer or two in these revered establishments! The conversation is typical, but mostly amusing, no-one is taking it too seriously, or concerned that you are wearing the right clothes, after all shorts and singlets are the go, if you like, and you’re not going to need to mortgage ya’ house when it comes to your turn to shout! 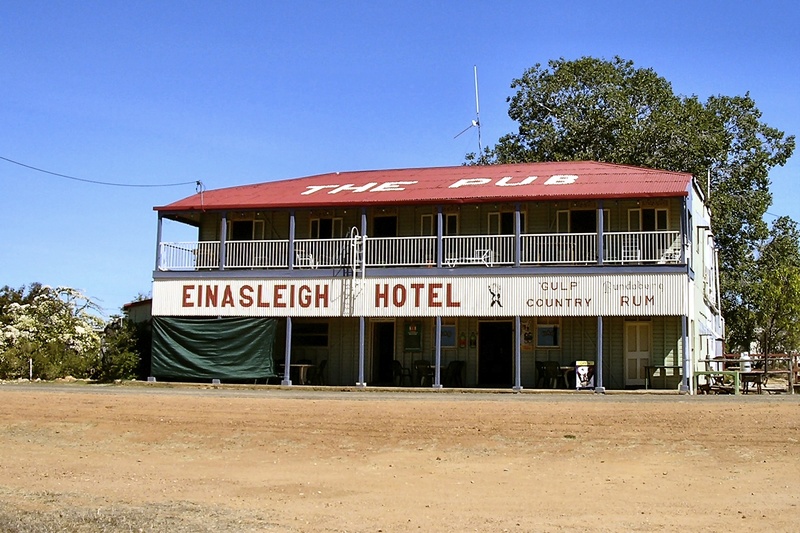 Crikey, Mrs Landy and I have enjoyed some great moments in some out of the way places in the Australian Bush, The Outback – and we might have had just that one too many on an occasion here and there, but that is usually because our classic pubs in the bush are timeless, especially when the amber fluid flows and the banter ramps up! Over the next couple of months “The Landy” will be pointed westward towards the remote Gibson Desert region and I’ll be making sure the route to get there is long and dusty as there is nothing better than dropping into a “real” pub at the end of a day’s drive just to say, G’day! So where is your favourite “watering” hole? May be on the way home! Cheers mate..
is pint me up scotty related to beam me up scotty from star track??? We don’t have a ‘watering hole’ as hubby doesn’t drink. But there are times when we travel that we go to a pub for a meal & a cold drink. The best ones are, as you say, in the country. Nothing fancy about them, just a place to slow down & relax. Favorite watering hole? Down in Sonoma, California. Murphy’s Irish Pub. No place like it. Try the fish & chips and mushy peas. Rick and I have played music there back in our traveling days. Wonderful place!